The Music Performance Trust Fund not only addresses the needs of our local communities but also takes pride in supporting our national treasures: the veterans, the forgotten jazz greats, ethnic diversity. We celebrate the achievements and look with awe and gratitude at the sacrifices and triumphs of our heroes and icons and continue to support the ongoing efforts of national programs bringing our diverse cultures together under one canopy of song. Here you will find samples of some of the National Programs that received MPTF support through our National Reserve Fund. MPTF is proud to provide the orchestra for the annual National Veterans Creative Arts Festival, presented annually by the Veterans Administration. 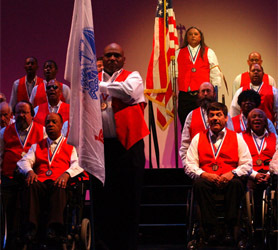 The Festival showcases and honors the unique, creative talents of our nation’s hospitalized veterans. Regional competitions begin early in the year and end with more than 200 finalists participating in the Festival exhibiting their talents in both the performing and visual arts. The Festival is held in October of each year in a different city across America. As with all programs in which MPTF participates, the public is admitted free to the both the stage performance and the crafts exhibit. Additional grant support provided by The Film Fund. The Smithsonian’s National Museum of American History announced the Jazz Appreciation Month initiative at a press conference in July 2001 with the help of noted producer-musician Quincy Jones and Branford Marsalis, officially making April JAM month. Since its inception, the MPTF together with the American Federation of Musicians annually sponsor over 250 FREE, LIVE, JAZZ performances in schools, libraries, community centers and other venues throughout the United States and Canada during the month of April. To assist teachers, librarians, and others educators and performers in celebrating JAM, the Smithsonian has published a brochure How to Celebrate Jazz Appreciation Month as well as promotional materials, all free to sponsors of JAM programs.